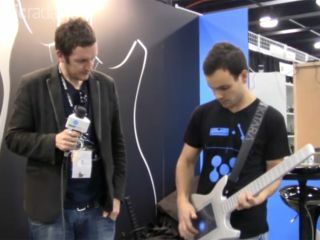 NAMM 2011: It was exactly one year ago today that we first laid eyes on the Misa Digital Guitar. Since that prototype, it's gone into production as the Kitara and will be available to buy in April for $849. We'll let Misa's friendly demo guy Michael explain what it does. Hit up the video to see and hear it in action. "Designed for guitarists that want to control electronic music instruments like synthesizers and samplers. It's got the same neck structure as on a normal guitar - 24 frets - and if you play a chord it's going to sound the same, notes-wise, as it does on a regular guitar." "The touchscreen lets you control the sound because in electronic music the ability to control multiple parameters simultaneously is very important."